Perisoreus canadensis a.k.a Grey Jay a.k.a Whiskey-Jack, originally uploaded by zircon_215. The Gray Jay (Perisoreus canadensis), also Grey Jay, Canada Jay, or Whiskey Jack, is a member of the crow and jay family (Corvidae) found in the boreal forests across North America north to the tree-line and in subalpine forests of the Rocky Mountains south to New Mexico and Arizona. It is one of three members of the genus Perisoreus, the others being the Siberian Jay, P. infaustus, found from Norway to eastern Russia and the Sichuan Jay, P. internigrans, restricted to the mountains of eastern Tibet and northwestern Sichuan. All three species store food and live year-round on permanent territories in coniferous forests. The gray jay is a native resident from northern Alaska east to Newfoundland and Labrador and south to northern California, Idaho, Utah, east-central Arizona, north-central New Mexico, central Colorado, and southwestern South Dakota. It is also a native resident in northern Minnesota, northern Wisconsin, northern Michigan, northern New York, and northern New England. The gray jay may wander north of the breeding range. In winter it travels irregularly to northwestern Nebraska, central Minnesota, southeastern Wisconsin, central Michigan, southern Pennsylvania, central New York, Connecticut, and Massachusetts. Perisoreus canadensis albescens is a resident from northeastern British Columbia and northwestern Alberta southeastward, east of the Rocky Mountains to South Dakota (Black Hills). It is casual in northwestern Nebraska. Perisoreus c. arcus is a resident in the Rainbow Mountains area, and headwaters of the Dean and Bella Coola Rivers of the central Coast Ranges, British Columbia. Perisoreus c. barbouri is a resident on Anticosti Island, Quebec. Perisoreus c. bicolor is a resident in southeastern British Columbia, southwestern Alberta, eastern Washington, northeastern Oregon, northern and central Idaho, and western Montana. Perisoreus c. canadensis breeds from northern British Columbia east to Prince Edward Island, and south to northern Minnesota, northern Wisconsin, northern Michigan, northeastern New York, northern Vermont, northern New Hampshire, and Maine. It winters at lower altitudes within the breeding range and south to southern Ontario and Massachusetts, casually to central Minnesota, southeastern Wisconsin, northwestern Pennsylvania, and central New York. Perisoreus c. canadensis is accidental in northeastern Pennsylvania (Philadelphia). Perisoreus c. capitalis is a resident in the southern Rocky Mountains from eastern Idaho, central south-central Montana, and western and southern Wyoming south through eastern Utah, and western and central Colorado, to central eastern Arizona and north-central New Mexico. Perisoreus c. griseus is a resident from southwestern British Columbia and Vancouver Island south through central Washington and central Oregon to the mountains of north-central and northeastern California. Perisoreus c. nigracapillus is a resident in northern Quebec (Fort Chimo, Whale River, and George River), throughout Labrador, and in southeastern Quebec (Mingan and Blanc Sablon). Perisoreus c. obscurus is a resident in the coastal belt from Washington (Crescent Lake, Seattle, and Columbia River) through western Oregon to northwestern California (Humboldt County). Perisoreus c. pacificus is a resident in north-central Alaska (Kobuk River, Endicott Mountains, and Fort Yukon), northern Yukon (Arctic Circle at the International Boundary), and northwestern Mackenzie (Mackenzie Delta and lower Horton River) south in Alaska to latitude 60° N.
Perisoreus c. sanfordi is a resident in Newfoundland and Nova Scotia. Perisoreus canadensis obscurus in Mount Rainier National ParkThe vast majority of Gray Jays live where there is a strong presence of one or more of black spruce (Picea mariana), white spruce (P. glauca), Englemann spruce (P. engelmanni), jack pine (Pinus banksiana), or lodgepole pine (P. contorta). Gray Jays do not inhabit the snowy, coniferous, and therefore seemingly appropriate Sierra Nevada of California where no spruce and neither of the two named pines occur. Nor do Gray Jays live in lower elevations of coastal Alaska or British Columbia dominated by Sitka spruce (Picea sitchensis). The key habitat requirements may be sufficiently cold temperatures to ensure successful storage of perishable food and tree bark with sufficiently pliable scales arranged in a shingle-like configuration that allows Gray Jays to wedge food items easily up into dry, concealed storage locations. Storage may also be assisted by the antibacterial properties of the bark and foliage of boreal tree species. An exception to this general picture may be the well-marked subspecies P. c. obscurus, once given separate specific status as the “Oregon Jay”. It lives right down to the coast from Washington to northern California in the absence of cold temperatures or the putatively necessary tree species. Gray jays typically breed at 2 years of age. Pairs are monogamous and remain together for their lifetime, but a male or female will find another mate following the disappearance or death of their partner. Gray jay pairs breed during March and April, depending on latitude, in permanent, all-purpose territories. Second broods are not attempted, perhaps allowing greater time for food storage. Gray jays cooperatively breed. 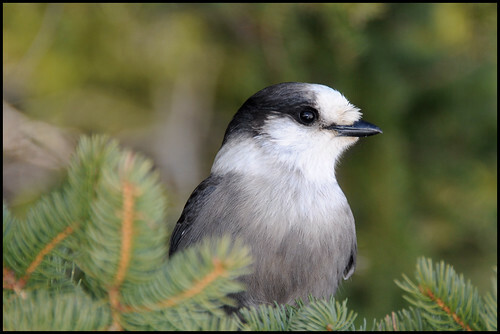 Strickland studied cooperative breeding of gray jays in Algonquin Provincial Park, Ontario, and La Verendrye Provincial Park, Quebec. In early June, when broods were 55 to 65 days old, the young fought amongst themselves until dominant juveniles forced their siblings to leave the natal area. Dominant juveniles, known as “stayers”, remained with their parents, and “leavers” left the natal territory to join an unrelated pair who failed to breed. Two-thirds of “stayers” were male. During the nest-building phase of the subsequent breeding season, approximately 65% of gray jay trios included “stayers” from the previous spring and their parents, and approximately 30% of trios included an unrelated “leaver”. Occasionally, two nonbreeders accompany a pair of adults. “Stayers” may eventually inherit the natal territory and breed, and “leavers” may eventually fill a vacancy nearby or form a new breeding pair on previously unoccupied ground. The role of “stayers” is to retrieve caches and bring food to younger siblings; however, this is only allowed by the parents during the postfledgling period. Until then, parents are hostile toward the “stayer”. This may reduce the frequency of predator-attracting visits to the nest when young are most vulnerable. The benefits of allofeeding may include “lightening the load” for the breeding pair, which may possibly increase longevity, reducing the probability of starvation of nestlings, and detecting and mobbing predators near the nest.